I just finished my card for the Christmas Clean and Simple card swap on Inspire Swap Chat. I love how beautiful the clean and simple cards turn out. I think they really need a wow stamp or embellishment that pops. 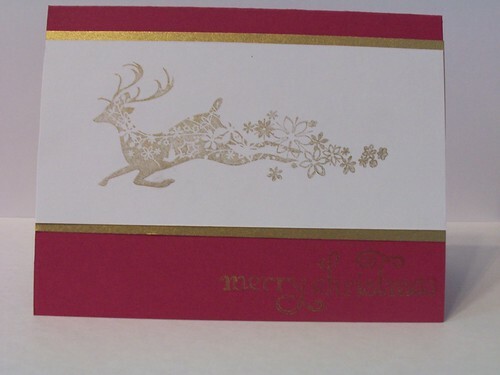 For my card I pulled out the Christmas stamps by Inkadinkado. All the stamps in this set are fairly large and very ornate. The reindeer is definitely my favorite of the set. I also had some pomegranate card stock that I wanted to use. I think the pomegranate is one of my favorite colors for Christmas. I rarely use the straight up red and green. I like darker and lighter shades for Christmas.